Alzheimer’s disease (AD) is the most common cause of dementia, accounting for an estimated 70% of cases. AD is an irreversible and progressive brain disease, with the most common early symptoms being memory difficulties and trouble learning new information. Alzheimer’s disease was first identified more than 100 years ago by Dr. Alois Alzheimer, a German neuropsychiatrist, in his patient, Auguste Deter, a woman in her 50’s who developed memory, language, visual-spatial, and orientation problems as well as delusional thinking. Upon Auguste’s death, Dr. Alzheimer autopsied her brain, finding atrophy and the two hallmark neuropathological signs of AD, amyloid plaques and neurofibrillary tangles. AD was originally thought to be a rare presenile dementia. Until the 1970’s, most cases of senile dementia were attributed to arterioscelerosis. Today, AD is recognized as the primary cause of cognitive impairment in older adults. We do not yet fully understand what causes Alzheimer’s disease (AD), but it is clear that it develops as the result of a complex series of events that take place in the brain over a long period of time. Essentially, every person with AD has accumulations of amyloid plaques (comprised of the toxic beta-amyloid protein) and neurofibrillary tangles (aggregates of the tau protein) in the brain. The abnormal accumulation of plaques and tangles cause neuron cells to die, leading to dramatic shrinkage and cell loss affecting areas of the brain that are responsible for memories, thoughts, sensations, emotions, movements, and skills. Scientists are conducting studies to learn more about plaques, tangles, and other features of AD. New technology has made it possible to visualize plaques and tangles by imaging the brains of living individuals. Findings from these studies may help researchers and clinicians better understand the causes of AD. It is likely that the causes include genetic, environmental, and lifestyle factors. In a very few families, individuals develop AD in their 30’s, 40’s, and 50’s. These individuals have a mutation, or permanent change, in one of three genes that they inherited from a parent. These mutations are autosomal dominant, meaning that inheriting the gene causes the disease. Thus, the children of individuals with autosomal dominant Alzheimer’s disease (ADAD) are at 50% risk to inherit the mutation. Only people who had a parent with ADAD are at risk to get this genetic form of the disease. ADAD accounts for only 1-2% of all cases. The “late-onset” form of the disease develops after age 65. Many genes have been identified that appear to affect risk for the disease. The strongest of these is the apolipoprotein E (APOE) gene. The APOE gene has three forms: APOE e2, APOE e3, and APOE e4. Carrying one or two copies of APOE e4 increases a person’s risk of getting AD. Carrying APOE e4, however, does not necessarily mean that a person will develop the disease. Also, people who carry only APOE e2 and/or e3 can and do develop AD. Large-scale genetic research studies are searching for other genes that increase or decrease susceptibility to AD. For more about this area of research, see the Alzheimer’s Disease Genetics Fact Sheet. A nutritious diet, exercise, social engagement, and mentally stimulating pursuits can all help people stay healthy. New research suggests that such healthy lifestyle choice also might reduce the risk of cognitive decline and AD. Scientists are investigating associations between cognitive decline and heart disease, high blood pressure, cholesterol, diabetes, and obesity, as well as lifestyle practices. Understanding these relationships and testing them in clinical trials will help clarify the extent to which controlling chronic health conditions and adopting healthy lifestyle practices may lessen the incidence of AD. Initially, short-term memory and the ability to learn new information are affected. Memory difficulties may appear subtle at first, often leading many individuals and families to question whether the symptoms are just signs of “normal aging.” As the disease progresses, a person may ask the same question repeatedly. Objects may be misplaced or lost, and details about recent events may be forgotten. These problems worsen consistently, often slowly. Mild AD: As Alzheimer’s disease progresses, memory loss continues and other cognitive abilities are affected. Problems may include difficulty with finding words and expressing ideas, getting lost, difficulty handling money and paying bills, taking longer to complete normal daily tasks, and poor judgment. Mood (e.g., apathy and depression) and personality changes are also common. Long-term memory, however, remains relatively intact at this stage. Driving becomes hazardous and should be stopped. People are often first diagnosed in this stage. Moderate AD: As the disease progresses, reasoning, visual-spatial skills, planning and organization, sensory processing, and conscious thought become increasingly affected. Memory loss and confusion increase, and people may begin to have problems recognizing family and friends. They may increasingly have challenges completing other basic daily activities, such as getting dressed. As a result, affected individuals become increasingly reliant on their caregivers. Patients may exhibit a variety of behavioral and psychological symptoms (e.g., agitation, wandering, delusions, and hallucinations) common to this stage. Severe AD: In late disease, long-term as well as short-term memory is lost. Speech is often limited to a few words. People become increasingly less responsive to others and the environment, and completely dependent on others for their care. Affected individuals may become bedridden. Pneumonia or another infection may result in death, however, the actual cause of death is Alzheimer’s disease. An early and accurate diagnosis of memory or other cognitive difficulties is crucial for several reasons. Foremost, a thorough evaluation can reveal any treatable or even reversible causes of cognitive impairment. If Mild Cognitive Impairment (MCI), Alzheimer’s disease (AD), or another dementia is diagnosed, it can facilitate planning and permit patients and families to access available medications and services. Also, with early diagnosis, critical safety issues (e.g., living alone, driving) can be addressed before a crisis occurs. At present, there is no single diagnostic test for detecting AD and other forms of dementia. Rather, the diagnosis is based on a thorough assessment by an experienced clinical to determine the presence (i.e., inclusion) and absence (i.e., exclusion) of particular symptoms. If done thoroughly, such a diagnostic process can yield a highly accurate clinical diagnosis. Cognitive impairment and dementia can result from a variety of progressive and non-progressive ‘irreversible’ as well as ‘potentially reversible’ causes. For example, potentially reversible causes of cognitive impairment and dementia include severe depression and metabolic disorders (e.g., vitamin B12 deficiency and hypothyroidism) as well as structural brain changes such as occur in Normal Pressure Hydrocephalus (NPH). Medication side effects can cause reversible cognitive difficulties. If a particular drug, or combination of multiple drugs, are causing the cognitive impairments, then stopping the medication(s) and/or changing the dosage may improve symptoms. In some cases, a person may develop cognitive impairment that remains stable and does not progress. A common cause of non-progressive cognitive impairment is a single stroke which permanently impairs certain functions. Another increasingly recognized cause of non-progressive cognitive impairment is traumatic brain injury, as might occur in an auto accident, sports, or combat. In addition to AD, progressive irreversible causes of dementia include vascular dementia, dementia with Lewy bodies, Parkinson’s disease dementia, frontotemporal dementia, and several other disorders. It is important for physicians to ascertain the most likely cause of the dementia, as the treatment plan may differ. A complete clinical history that includes questions about the individual’s overall health, current and past medical conditions, prescription and over-the-counter medications, risk factors (e.g., head trauma, excessive alcohol use), ability to perform daily activities, and changes in behavior and personality. Physical and neurological examinations to, for example, look for changes such as slowed movement, weakness, or other symptoms linked to neurological disorders such as Parkinson’s disease or stroke. Neuroimaging to look for structural (e.g., CT, MRI), metabolic (e.g., SPECT, FDG, PET), or disease-related (amyloid PET) changes. Laboratory tests of blood and urine to check for possible contributors to any cognitive difficulties, such as a B12 deficiency. Neuropsychological assessment measures performance on paper-and-pencil tests assessing orientation to time and place, recent memory, language, attention, visual-spatial abilities, and executive functioning (e.g., reasoning, problem-solving, insight, multi-tasking, and planning). Some individuals may have more memory or cognitive difficulties than is typical for people their age, but continue to be able to manage their day-to-day activities. In this case, the doctor may diagnose MCI, a high-risk pre-dementia state. For more information on diagnostic evaluations, please contact our Memory Assessment and Research Center at 949.824.2382. Two classes of drugs for AD are available that have been approved by the U.S. Food and Drug Administration (FDA). The first class is the cholinesterase inhibitors, consisting of Aricept (donepezil), Exelon (rivastigmine) and Razadyne (galantamine). Clinical studies have confirmed that treatment with these medications results in improved cognitive function, relative to placebo. They are generally safe though reversible side effects like diarrhea, nausea, and vomiting can occur. Among these medications, Aricept and Exelon are approved in mild, moderate, and severe AD. Razadyne is approved in mild and moderate AD. The other class of medications available includes only the drug Namenda (memantine). Namenda is approved for moderate to severe AD. As it is thought to have a different mechanism of action than do the cholinesterase inhibitors, Namenda is often used in combination with the other medications. In fact, in 2014 the FDA approved a combination of Namenda and Aricept called Namzeric. None of these drugs have demonstrated efficacy in Mild Cognitive Impairment (MCI). Please talk to your doctor if you or your loved one has AD and you believe that you need these or any other medication. To learn more about FDA-approved medications for AD, view the UCI MIND Family Education workshop video, Advances in Dementia Treatment: Current and Future Medications. Rule out unrecognized medical illnesses that could be causing a change in behavior. If there is no medical cause, try non-pharmacological strategies first to manage the symptom. Use medications with caution, as the antipsychotic drugs frequently prescribed for behavioral and psychological symptoms of dementia are not approved for this use, have little benefit, and come with significant side effects, including increased risk for death. Partner with your doctor to address behavioral symptoms and the use of medication, when necessary. To learn more about managing behavioral symptoms for AD, view the UCI MIND Family Education workshop video, Alzheimer’s disease: Behavior management and communication strategies. At this time, there are no medications to slow, delay, or prevent AD. But, researchers are hopeful. At UCI and around the world, researchers are investigating disease-modifying therapies. Clinical trials are testing many possible interventions, such as immunotherapy and other anti-amyloid treatments, neuroprotective interventions, cognitive training and physical activity, and other treatment strategies. To learn more about clinical trials at UCI MIND, contact our research team at 949.824.0008 or research@mind.uci.edu. This guideline, provided by the California Department of Pubic Health, presents core care recommendations for the management of Alzheimer’s disease. It assumes that a proper diagnosis has been made using reliable and valid diagnostic techniques. 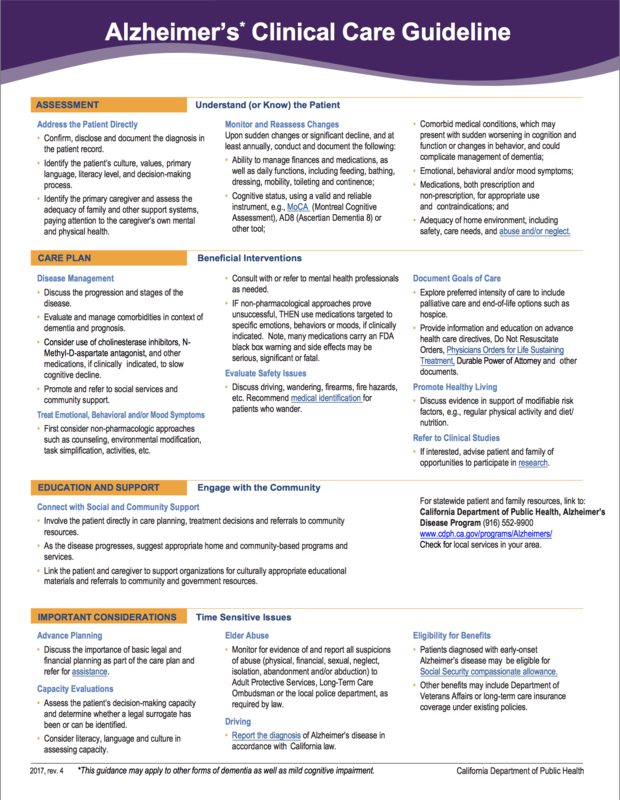 The guideline is designed for primary care practitioners but may be a useful tool for all members of the treatment team, including family members.